RISCO are pioneers of cloud-based technology within the electronic security sector. Their professional iRISCO smartphone app gives you the ability to fully control your LightSYS2™ or Agility3™ alarm system from anywhere whether that be arming the system at night from the comfort of your bed, checking that you didn’t forget to set it when out shopping, or unsetting your shed from your hotel pool to give your gardener partial access. Using their highly secure Cloud service RISCO also offer “Live Video Integration” which allows you to add RISCO VUpoint IP cameras to your security system enabling you to stream live images via the iRISCO app, and more importantly, to receive video clips straight to your smartphone if your alarm activates, giving you instant views of your property (subject to camera positions) so that you can see whether someone has broken in or whether in fact it was your cat performing acrobatics on the back of your sofa. The RISCO Cloud service and the iRISCO app offer seamless and instant remote control of your home security. Building on that stable platform RISCO now offer a simple, affordable level of smart home automation. We have all heard the latest TV and radio advertisements offering app based control of your heating from your phone. Now your award-winning professional security system can offer much of the same automation! By connecting a RISCO Smart Home Gateway to your router you can add over 200 hundred smart devices to your network and control them all from the same fantastic iRISCO app that administers your security system. What is a Smart Device? The RISCO Smart Home Gateway allows wireless Z-wave smart devices to connect to it. The Smart Devices that RISCO currently offer are plugs, boiler thermostats, radiator thermostats and light switch controls. You can plug a lamp into a smart plug and control it remotely or even dim it. You can replace your boiler thermostat with a smart version and control the temperature from anywhere. For individual temperature control of a single room you can control the radiator itself. Adding smart modules to your light switches enables you to fully automate your home lighting. 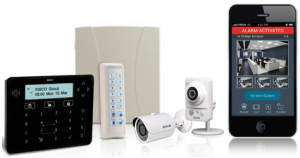 The seamlessly integrated RISCO family of products provide you with a total security solution for increased peace of mind. If your intruder alarm activates then you will receive an immediate alert through the app. With Live Video Verification cameras you can then check footage and view the live stream. If you see anything untoward, with the Smart Home Gateway you can turn the lights on and off to attract attention and cause concern to the intruder. With the internal VUpoint camera you can even listen in and communicate with whoever is there (“Boo! I’m the poltergeist playing with the lights”). Obviously the home automation aspect is for more relaxing actions also…turning your lights off from the comfort of your bed; turning them on if you get up in the night, controlling the temperature in your home either when you are there or for when you arrive. The potential is significant and you only need expand the system as and when it becomes convenient. For more information on the RISCO Smart Home please read our article, see the video on our home page or contact us for more details.